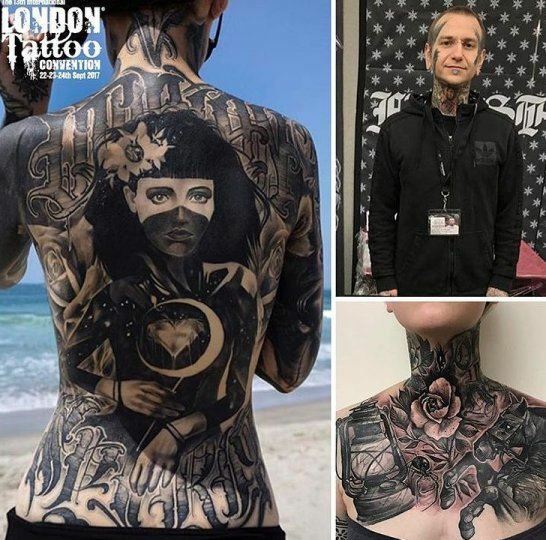 Hello Anrijs Straume, thank you so much for taking some the time to answer some questions for our readers.Please start by telling us something about yourself and what inspired you to start tattooing? imagine how it could turn out. Q: Your tattoo style is really unique, it probably took you some time to figure out what kind of style would be enough interesting to express your creativity. A: I think anything anyone creates is an art. Even when I just started, I still tried to create something fresh for every customer, I also had a lot of sketches with my own created characters. 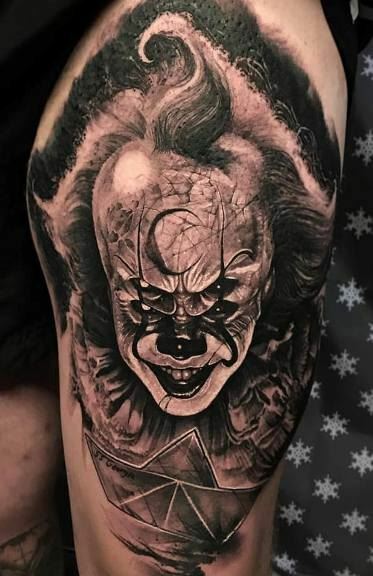 It took me good 5-6 years of tattooing experience and trying many, many techniques/styles to find what suits to me the best. Q: How long are you into the world of professional tattooing? A: I started tattooing in 2008. That wasn't really professional or anything. I save up some money for machine and stuff and started tattooing from home. More like a hobby, few times a month I did some small tattoos on friends. Never ever I could even dream that one day I will be able to do good quality tattoos like in some tattoo magazines. It wasn't easy with no knowledge and no one to help and it wasn't right the way how I started, but that was my only option at that time. 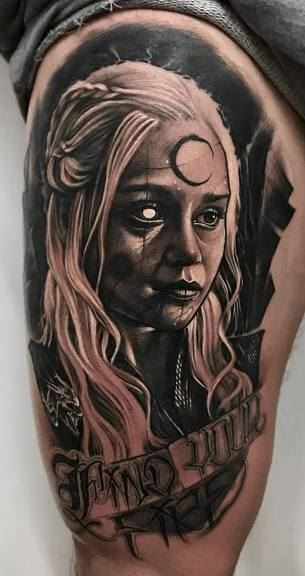 Later on I realized It can't continue like that and I was searching some studios to finally get some real experience and knowledge in tattooing. I manage to get apprenticeship in 2009 and I would say I started tattooing around 2010 working in a studio. Q: Your style sets you apart from many artists out there. All of your designs are unique, even portraits which usually are expected to look as real as possible but you, have a special way to create something new. You call your style "Dark Trash Realism" give me a little description. A: I was always a huge fan of horror art. I love ghost stories, horror movies, atmospheric dark music and Photography. I try to put some of those feelings in my tattoos. I came up with it around 5 years ago, I was learning new techniques, more black and gray type of work with high contrasts. Experimenting with new approach on my designs and trying new things, somehow a mix of million things made something like that. I realized I had never seen anyone doing the mix of this together. I fell in love with the way I could see that feeling I was looking for in my artworks. That's when it clicked and I continued to develop this style further. I realized and started to see more often that many other artists are inspired and start using some of my artwork motives/signatures for their tattoos and drawings. Customers and artists started to call it - Anrijs Style or some other weird names, so I wanted to name it myself, so that there would be real name for that style. I decided to name it - Dark Trash Realism. Dark - for more dark atmospheric feel in the designs rather than just Horror style. Trash - I like to do work messy/sketchy, dirty. Realism - as I use photo references for most of my work. A: Us humans are the worst of the kind of evil in this world anyway, doesn't even need to be horror style or with horns to see that. I try not to put any huge story or any negative energy to my tattoos. I see characters I crate as Demons, but more like fantasy or from other dimension. Q: How much rebellion is necessary for creating good art? Did you feel influenced by someone? A: When I first started tattooing then yes. 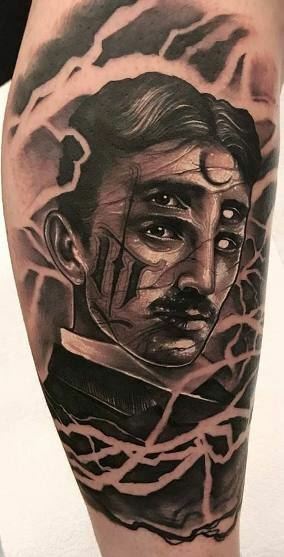 I had lot of artists who were really big influences in my work - Tim Burton, Joshua Carlton, Tommy Lee Wendtner, Buena Vista Tattoo Club, Eckel, Nikko Hurtado and many many more. Everything is influence to me. Music, movies, stories, memories, thoughts all artists around the world. Everything what I've seen and experienced is making everyday decisions now and same goes in art. it's just everything and from everywhere. Q: I love every single tattoo you did, I don't even think I have a favorite one. I can only imagine how much time takes to develop the basic ideas to final one with the clients - I bet they all have trust in you that they will have some awesome design at the end, tell me more about the making process. Do you first draw some sketches? don't like it and ask for some changes. I always try to be open minded to any changes as it's going on their skin not mine. But after we agree on the design, most of the work (textures/background/details etc..) I do straight on the skin. Some designs can take up to 10+ hours to prepare from start. Talking about the ideas, finding the references, drawing some sketches, check with customer, more sketching and sometimes even start it all over from nothing. Q: You can bring the truest, most recognizable note in someone's personality on the skin. What kind of personality traits are your favorite to tattoo? 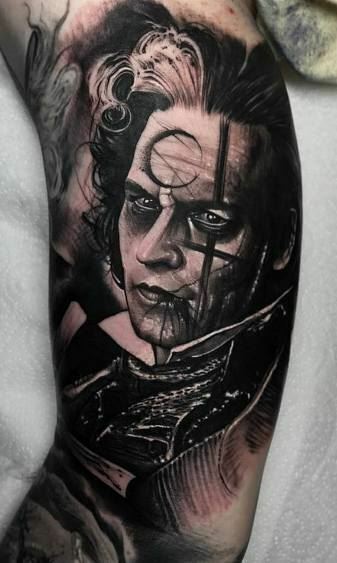 A: I like tattooing characters I've seen myself from movies or tv shows. I have a lot ides and it's easy to find the good references. sometimes I get asked to do characters that I've never heard in my life. That makes it little harder as I don't really know where to start and It can feel like I'm tattooing just portrait of someone's family member. With no background or no idea what photos will show strongest facial features. I would draw lot's of portraits of myself and everyone else if I had time for it. 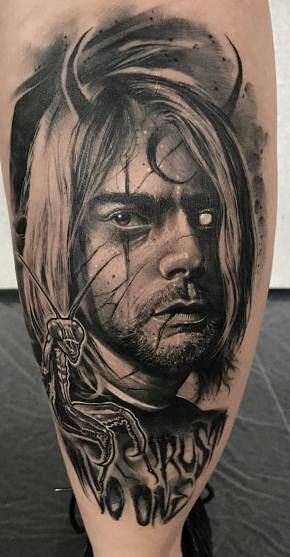 I already tattooed once portrait of myself on other artist. I really inspired Her in her tattoo journey and she wanted to get my portrait tattooed on her in my signature style. That was really fun tattoo, I really hope to do few more of them in near future. 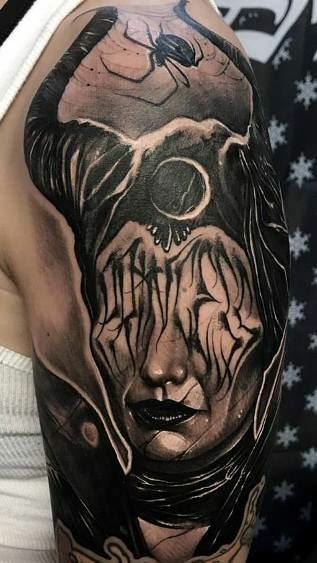 Q: Brilliant dark shadows and highlights, I really love your tattoo technique, very bold. All black & gray, have you ever thought to try some color inks? A: Actually for the first 4-5 years of me tattooing I did mainly color work. My favorite tattoo styles were - cartoon and new school back then, I was really pushing that. I remember I really didn't like black and gray tattoos and I was thinking why would anyone have black and gray tattoos when it's not 80's anymore and we can have all these awesome colors. Right now I really love black and gray work. I don't think I will do full color designs in near future, but I have few cool ideas to include color for some of my work. Q: Keeping up a busy schedule is hard, how do you manage the appointments? How long clients usually wait? 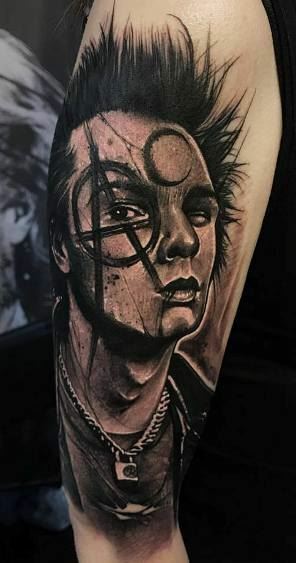 Q: You already created a very interesting, recognizable style, I bet everyone who sees some photo of your tattoo work, immediately knows that's your work, no need of description ;) any thoughts on maybe doing something different? Or you would like to stick with this? A: I have lot of interesting concepts, ideas on my mind what will be different from what I mostly do, but I don't want to do mega changes over night. I think my art changes all the time and I definitely will want to push it further and make something more. A: I don't really do any art on other mediums. I used just to draw a lot on the paper and paint with some watercolors, but I haven't really worked on any other mediums, then paper or skin. I would love to try something more, but at the moment all my time goes to prepare everything for tattoo customers and few side projects. Q: Every day new clients and some old coming back for another tattoo, every reaction from them is one more proof of your dedication. What reaction from them makes you love your work even more? Even when the schedule looks crazy? A: It blows my mind that people want to get tattooed by me and are willing to travel from different cities and even countries for that. I work in private studio now and It's really special every day when costumer comes specially to get one of my creations on their skin. I love meeting them all, spending day with customers, hearing their stories about life, job and other interesting stuff. I just love when they are happy to carry my art around the world. I wish I could tattoo everyone who wants to get tattoo from me, but unfortunately I do run out of time to get everyone in. Q: Any motivational words for those who would like to try themselves in this job? A: If anyone feel like - I could try tattooing, then it's not for you. You need to know that's the only thing in the world what you want to do and - GO FOR IT! Good luck for everyone in this journey! It's fun and It's hard work. Never stop learning.